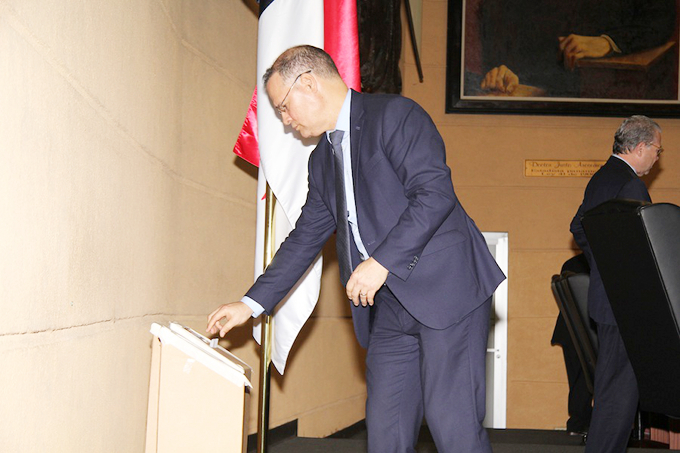 By rare special procedures specified in a resolution promoted by PRD leader and northern Veraguas deputy Pedro Miguel González, there was a secret ballot by which each participating deputy could vote for seven candidates, with the top vote getters in each party caucus getting that party’s seats. Apportionment by party caucus was based on the composition of the National Assembly as a whole. The Panameñistas boycotted and are pressing their claims in court. Photo by the National Assembly. So, a Credentials Committee of fire-breathing radicals, ready to impeach the president and any high court magistrate who gets in their way? Or a Credentials Committee of tawdry crooks, ready to twist whatever arms need to be twisted to avoid any serious investigation of their own behavior? Perhaps both. Maybe neither. The new Credentials Committee is PRD deputies Rubén De León, Elías Castillo and Alfredo Pérez; Cambio Democratico’s Sergio Gálvez, Fernando Carrillo and Juan Manuel Poveda; for the Panameñistas Jorge Alberto Rosas and Luis E. Quirós; plus independent legislator Ana Matilde Gómez. Castillo, Gálvez and Rosas have all been mentioned more prominently than most of their colleagues in the swirl of financial scandals around the entire legislature, but none of them are under formal investigation, let alone facing specific charges and much less having been convicted of anything. One might expect, however, that the short-handed Supreme Court may have taken the election as some sort of message about investigating Gálvez over circuit funds, Rosas over Odebrecht or Castillo’s relatives over the Blue Apple affair. Any apocalyptic theories about these things, and whether an impeachment is in the cards, would be diminished by the ephemeral nature of the appointments. The legislature is out of session between the end of April and the end of June, and then they choose the next Credentials Committee. While it is true that committees often meet during legislative recesses and presidents can convene special sessions, this committee’s composition looks defensive rather than offensive. The way to the new configuration spelled the coming marginalization of the National Assembly’s president, CD deputy Yanibel Ábrego. She was named in too many unsavory situations — purchases of public land for pennies a square meter, circuit fund abuses and so on — and made the high-water mark of her career an ability to build and manage three-party coalitions. But now the public patience with corruption wears thin and the old coalition is irreparably shattered. In order to get his resolution to recompose the Credentials Committee passed, González had to appeal Ábrego’s ruling that his resolution was out of order. That passed easily, with both PRD and CD support. Look for her to step down from the dais in July, probably never to return. President Varela says that he will assert his authority. How and against whom are interesting questions. With Pedro Miguel González the main protagonist, one lever the president will not have is that he could make sure the González does not get re-elected. That’s because the Veraguas legislator says he will not seek any public office in the 2019 elections. But if atomic weapons are to be flown in, there is this 26-year-old US terrorism warrant against González and there is this troubled US president looking for a distraction. Most probably the legislature has just warned the executive and judicial branches to back off, and confirmed to the president that there will be no nominees to the high court ratified without some serious negotiations that bring in other matters. The next move, it seems, would be either by President Varela or the Supreme Court. But that next move might just be to wait a few months.